Tungsten electrodes (AWS classification EWP) contain 99.50 percent tungsten, have the highest consumption rate of all electrodes, and typically are less expensive than their alloyed counterparts. 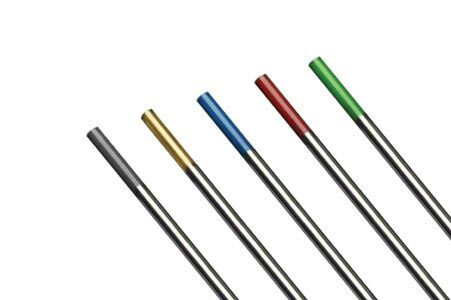 These electrodes form a clean, balled tip when heated and provide great arc stability for AC welding with a balanced wave. Pure tungsten also provides good arc stability for AC sine wave welding, especially on aluminum and magnesium. It is not typically used for DC welding because it does not provide the strong arc starts associated with Thoriated or ceriated electrodes.